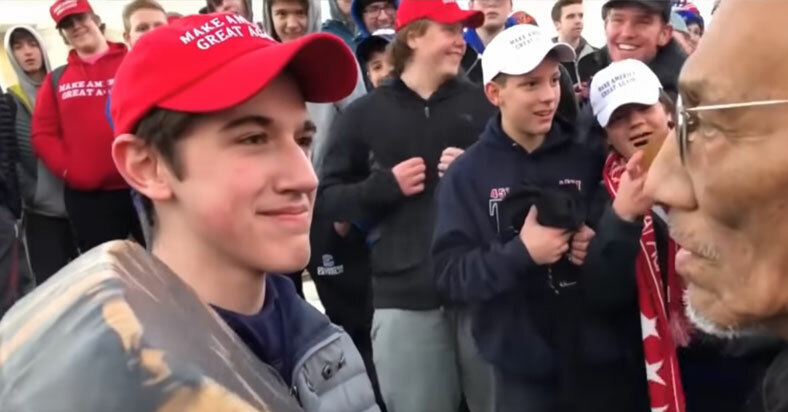 A video allegedly portraying a group of students of Covington Catholic High School from Kentucky wearing a “Make America Great Again” hat standing against an elderly native person who was repeatedly beating a drum in a chant close to the face of a student who simply managed to simply smirk through it all. The short footage of the said event was as bright as day in foretelling a happening which subsequently—and inevitably— sparked a nationwide controversy. The said student in the video is Nick Sandmann, a junior high school student, “smugged” face-to-face with the Omaha elder named Nathan Philips. The two were both participants of the events traditionally being held in Washington D.C. that day. But is that really all there was to the story or is there something more to the overall picture of the said event which the swift media had overlooked before jumping into the scene and began disseminating an incomplete or, worst, a false narrative to what really took place that day? I must admit that, upon seeing the short video which the media capitalized on as a premise to the scandal, my initial impression was that of a high school child who, through sheer “entitlement,” displayed a level of arrogance which was bolstered by the presence and jeers of his peers. I mean, we are used to seeing this kind of imagery as involving a group of bullies or gangs who find strength in commonality and numbers going against a hapless person as is typically portrayed in movies and, in some cases, even actual happenings in real life. Nobody likes the idea of bullies, let alone the notion of potentially getting bullied, especially towards a senior adult which was shown in the video. (If that is indeed the real picture of the story, that is.) Many are therefore compelled to react in a manner that is reprimanding to the people involved, particularly to the party deemed the “bullies.” Knowing people, their level of contempt significantly takes on different shapes or form and it is never a good idea to be the subject of such wrath—this is, to some extent, completely rational and understandable. But therein goes the problem with the snippet which the media used to spread the story—it is incomplete and was sorely taken out of context which seemed to vilify an otherwise innocent person or group of persons whose only crime is to stand their ground or, in the case of Sandmann, to smirk, given a confusing and conflicting disposition. I have actually seen a longer version of the story that, while only collated, was done so in a manner that shows a good chronological order of what happened in that particular day in D.C. The real premise of the story is that these Covington High School students were actually confronted by a small number of Black Israelite (black supremacists) protestors whose sentiments are deeply religious in context and has “hate” as its tone. I mean, we talk of high schoolers here who are advised to stay in a certain place while being faced by antagonistic forces that, while small, are obviously intimidating. The issue is only further complicated by the presence of the native American Nathan Philips who, in the context of diffusing the tension, was merely stood against. How the students of Covington High School reacted, while rather callous, are actually quite commendable in that they did not resort to violence to address a provoking problem which otherwise might be the case if set among adults. Given all that, I am quite convinced that the students in the said controversy were not the people to blame as they are also a victim to an unforeseen event they had been forced to face, though they did not really have to. Not only did reporters and journalists made a lapse on judgement and proper research on the controversy, many known personalities have also rushed their unfavorable sentiments on social media. Some of their statements on their posts even encourage physical violence towards the students. These personalities, who are also social media “influencers”, blew the story out of proportion and made a national issue out of a situation that has garnered more exposure than it should. But perhaps the exposure is worth it. Perhaps we, the public, needed to see this. We needed to see how irresponsible and unverified journalism, especially from big news companies with political biases, can easily stir up public opinion. It’s quite disheartening to hear the threats the students and the school has been receiving from “civilized” people. Threats such as the students being locked in the school and burned to the ground, school shootings and bombings. This, despite the fact that we still mourn the many deaths of victims of the same recent tragedies. Atty. Robert Barnes has offered his services for free to the families of the Covington Catholic students to file libel lawsuits against personalities and media organizations that has maliciously spread lies and defamations towards the students. The families of the teens has given a 48 hour grace period for the assailants to retract and apologize for their false statements or face a lawsuit. Jamie Lee Curtis, Jack Morrissey, and Jake Tapper are some personalities who have now apologized for their coverage and comments.